Gillespie Lab_13 is a space where children explore science, investigate their own questions and turn their ideas for inventions into reality. With the support of their Scientist / Inventor in Residence Carole Kenrick, pupils engage in enquiry-led and hands-on learning within and beyond their usual science lessons. The Lab_13 Management Committee, comprising children aged nine to eleven, plan and lead STEAM (Science, Technology, Engineering, Art and Mathematics) engagement projects that the whole school gets involved in. Research teams of pupils also carry out real scientific research with university researchers and present their findings through reports, at science festivals and to the media. After-school STEAM clubs are very popular and give pupils an opportunity to pursue their passions, unleash their creativity and develop their team working skills. Last year 100% of Gillespie pupils met or exceeded expectations in Y6 Science assessments. In addition, Lab_13 has had an unexpected impact on the school’s most vulnerable pupils with many coming out of their shells and growing in confidence. 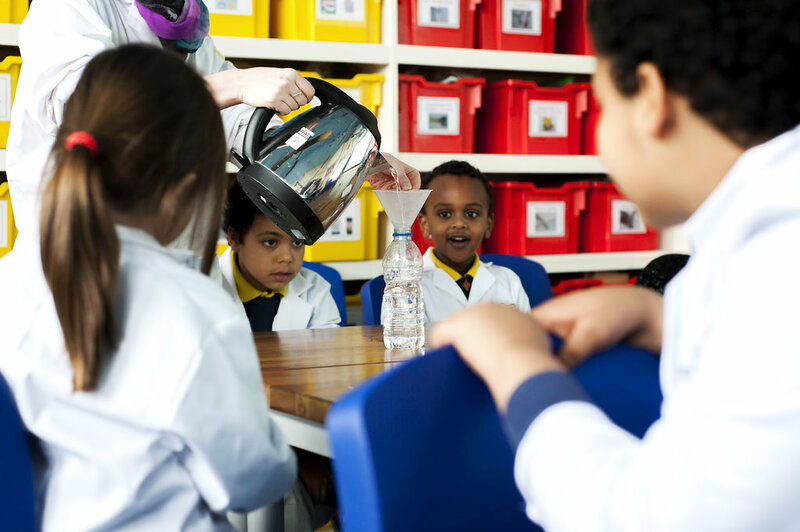 Gillespie Lab_13 is also the hub of a growing network of schools across Islington. Carole Kenrick is playing a key role in sharing Gillespie Lab_13 practices and endeavouring to ensure that their impact is sustained at secondary level. She regularly presents workshops and speaks on panels at national conferences and science events. Carole is a 2016 winner of the Let Teachers Shine Award and is embarking on a PhD at UCL’s Institute of Education into the impact of primary science labs on children at primary and beyond. She also works for The Ogden Trust, setting up and supporting primary Science networks and Phiz Labs across London and Surrey. Before this Carole worked for four years in Initial Teacher Education training secondary Science teachers for the Teach First programme, a charity whose mission is to address educational disadvantage. Carole has a degree in Physics and an MA in Educational Leadership. Click on the link below to view the BBC World Service website and a piece from some of Gillespie’s Lab_13 committee & our Scientist in Residence Carole Kenrick. Irchester News: Happy New Year from the new Committee! Science in the News reporting at Irchester! A team of keen pupil scientists, supported by our Resident Scientist in managing our Lab_13 science and technology lab. The pupils take leadership responsibility for involving children across the school in additional science investigations and activities. The children contribute to the Lab_13 Blog and Twitter feed and support the school in making links to the Lab_13 network of schools.